Do more. By Doing less with Helpchat Promo codes. Love for comfort lets you develop a new idea on how to get more output from less input. Everyone wants to do everything and get everything. One of the best ways to implement this is HelpChat. 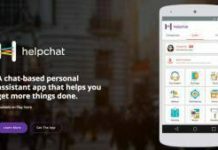 Helpchat is a chat based personal assistant app that helps you get more things done. This could be anything – from recharging your phone to tech support, travel booking, holiday guidance, ordering groceries and food at your doorstep, providing shopping assistance, helping you find the best deals & coupons, web check-in, and laundry. Helpchat can get all of them done for you. Who do not want to get everything done at one place? With the increasing popularity of utility applications, companies are trying to give you best out of it. Helpchat offering Recharge & Bill Payment up to 50% cashback. Valid for all recharges – Prepaid, Postpaid, DTH & Datacard. Valid on successful transactions only. Valid for new as well as existing users. How to Cashback on Mobile Recharge using HelpChat app? Open > Verify mobile > Update profile. Apply cashback coupon from above (Update app if you don’t see coupon option).